This colorful verse is a small piece of Stephen’s speech. In these words, God reminds us that we are also stiff-necked and stubborn. We can use this verse to teach our children to have a stubborn trust instead of a stubborn attitude. Here is a clip of a hamster doing what hamsters were designed to do. When hamsters live in the wild, they find food and stuff it in their cheeks so they can take it back to their burrows. This is what helps them stay alive. This hamster does not live in the wild so it has nowhere to go with its stuffed cheeks. It sits in the corner with a full mouth and a stiff neck. 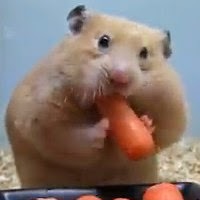 This hamster needs to put down some of those carrots and trust that its owner will give it a new carrot tomorrow. When adults use the term stiff-necked we are usually talking about someone who is stubborn. Someone who thinks they know better than the person who is in charge. When we are stiff-necked we are refusing to trust that our parents or our teachers know what is best for us. When we act this way we are not showing trust. God gave us parents and teachers to keep us safe and to help us learn and grow. Even if we do not like what they are saying, we need to trust and obey. This Bible verse came from a speech to a group of people who refused to believe that Jesus was their Savior. They were stiff-necked and stubborn. They turned away from the gift of eternal life. Just like the hamster who can't even eat because his cheeks are full, these people stubbornly refused God's gift. God loves you and He cares for you. The people in your life who care for you are a gift from God and you are a gift to them. Don’t be stiff-necked, sitting in a corner with a full mouth of carrots, ignoring God’s gift. Let God help you to trust in Him and obey.